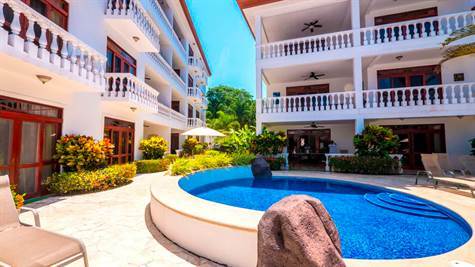 Located on the peaceful south end of Jacó Beach, La Paloma Blanca is a beachfront condominium community that offers luxury, tranquility, and relaxation in a vacation resort setting. This 2 bedrooms 2 bath condo offers many amenities including four pools, community BBQ area, storage units, 24/7 guard-gated security and professional property management for carefree home ownership whether you plan to enjoy the beach-life year-round or part-time. And while you're away you can earn substantial vacation rental income too. Jacó Beach is one of Costa Rica's most popular beach towns with all sort of shops, restaurants, nightclubs, gyms, yoga and art studios to enjoy. Savor the beautiful sunsets every evening right from your pool deck or walking along the beautiful crescent-shaped beach. By day you can play in the pool or frolic in the ocean as Jacó is known for its world-renowned fun surf with waves for every skill level from beginner to advanced. By night the town offers fine dining, casual dining, live music, and many other fun activities.